Not only is it a house made out of expanded polystyrene, but it’s in the shape of a dome and can be constructed in about 3 hours and pieces can be carried by 3 people. How awesome is that? You can mix and match the sections to make just about any layout you want. 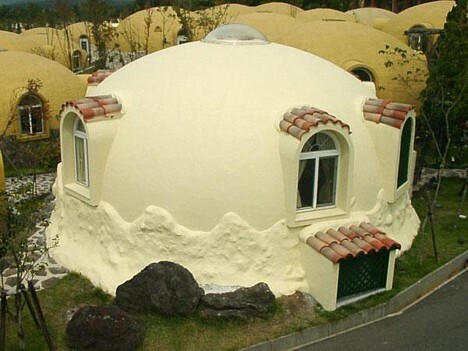 On top of all this, there is little waste in making the dome houses and they’re super energy efficient to heat and cool. And the basic models start at $30,000. Looking at them you might think they not that spacious but really, how much space to we need. The more space you have the more you’ll just fill it up with things we don’t really need. I’m digging it. My wife and I agree that if we could buy up some land and have this built there then we would to it. Maybe some time in the future we’ll be able to since it doesn’t look like this is an international thing and more of a Japan only concept. But man, I’m so on board with these houses. What do you think? This entry was posted on Monday, August 11th, 2008 at 9:45 pmand is filed under . You can follow any responses to this entry through the RSS 2.0 feed. You can leave a response, or trackback from your own site.